Dermatitis around the eyes requires attention as soon as possible. 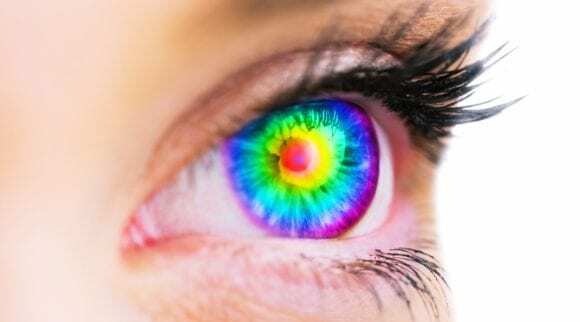 After all, our eyes are a very important sensory organ. When we begin to suffer from irritation near them or on our eyelids, we usually get very concerned. 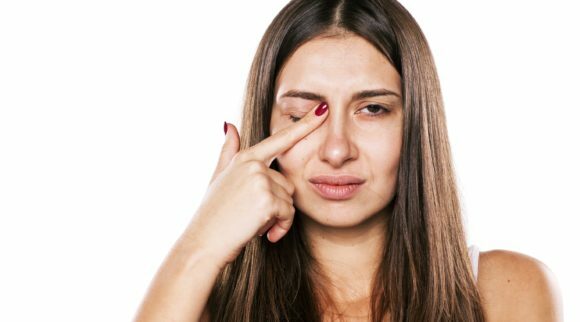 The good news is that most of the irritation on our eyelids or around our eyes is caused by a form of dermatitis. 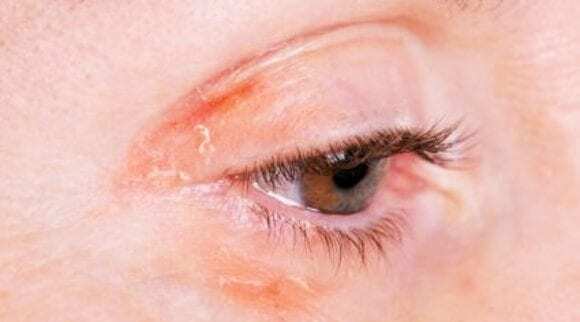 Dermatitis around eyes may look like a serious condition. In some cases, it can be a serious issue, but with most people, it is easily treatable. 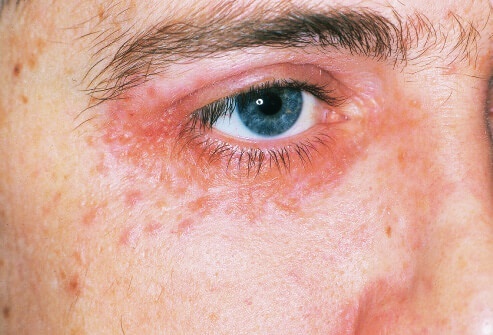 There are several forms of dermatitis that can occur around the eyes. 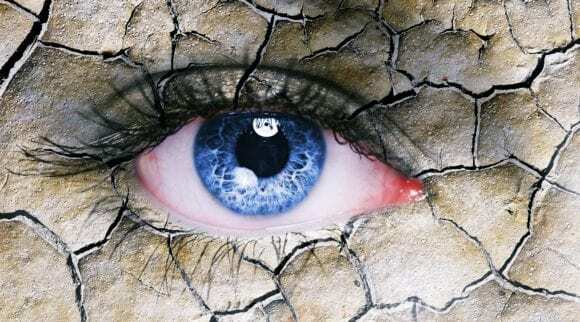 This article will explain the four types of dermatitis around the eyes, how to prevent it, and products that will help you control any dermatitis that develops. This article does not take the place of a visit to the doctor. Before treating any type of dermatitis around the eye, seek a medical opinion. 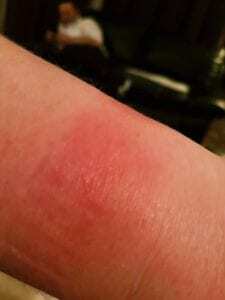 It may be something more serious or it could be something that has nothing to do with dermatitis at all. Irritant contact dermatitis is the most common type. This nonallergic skin reaction occurs when a substance damages your skin’s outer protective layer. Some people react to strong irritants after a single exposure. Others may develop signs and symptoms after repeated exposures to even mild irritants. And some people develop a tolerance to the substance over time. Allergic contact dermatitis occurs when a substance to which you’re sensitive (allergen) triggers an immune reaction in your skin. It usually affects only the area that came into contact with the allergen. But it may be triggered by something that enters your body through foods, flavorings, medicine, or medical or dental procedures. You can become sensitized to a strong allergen such as poison ivy after a single exposure. Weaker allergens may require multiple exposures over several years to trigger an allergy. Once you develop an allergy to a substance, even a small amount of it can cause a reaction. Below is a list of a few allergens that are relatively common. 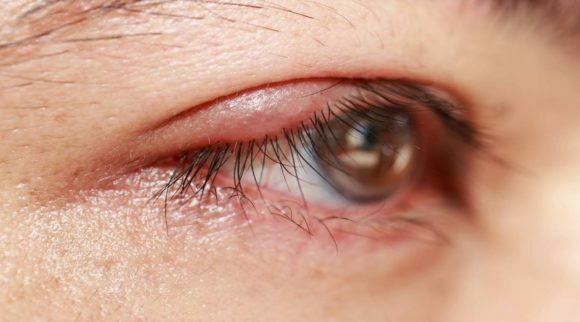 If you have come in contact with any of these and developed dermatitis around your eyes, you may be allergic. As you can see, there are many things that can cause dermatitis around the eyes. There are not too many complications after you develop any type of contact dermatitis. Repeatedly scratching the affected area could cause it to become wet and oozing. This environment is a good environment to develop an infection. Scratching should be avoided at all costs. If you have been evaluated by a doctor and they decide that you do have some type of contact dermatitis, there are ways to prevent it from developing again. Apply a barrier cream or gel. These products can provide a protective layer for your skin. Use moisturizer. Regularly applying moisturizing lotions can help restore your skin’s outermost layer and keep your skin supple. As you can see from this list, several preventative steps are applying a cream, washing your skin, or using a moisturizer. Later in this article we will discuss which products are the best to prevent and treat dermatitis around your eyes. As stated earlier, you will want to go to a doctor to determine what is causing the dermatitis. They can ask pointed questions about the products you use and if they cannot determine the cause of your dermatitis with a Q&A session, your doctor can perform a patch test. A patch test will determine what irritates your skin. Small amounts of allergens are applied to a patch that is adhered to your back. These patches will stay for several days until you follow up with your doctor. After removing the patches, your doctor will be able to determine what allergens are causing your dermatitis. After identifying what allergens are causing the dermatitis around your eyes, your doctor will recommend some type of treatment plan. The treatments can be prescriptions pills and creams or a recommended over-the-counter treatment. Over-the-counter treatments will be discussed later in this article. The next form of dermatitis around eyes is atopic dermatitis. It is better known as eczema. Atopic dermatitis (also known as AD) is the most common type of eczema. More than 18 million American adults have atopic dermatitis. This form of dermatitis often appears as a red, itchy rash normally on the cheeks, arms and legs. Atopic dermatitis typically begins in childhood, usually in the first six months of a child’s life. Even though it’s a common form of eczema, it’s also severe and long-lasting. When you or your child have atopic dermatitis, it may improve at times, but at others it may get worse. Atopic dermatitis may disappear as a child grows older, though some children will have atopic dermatitis flares into adulthood. There is no known cause for atopic dermatitis. It is unknown if this form of dermatitis is a genetic issue or caused by some other issue. Atopic dermatitis runs in families, but there is no clear evidence how it is passed from one generation to the next. If one parent has AD, asthma, or hay fever, there’s about a 50% chance that their child will have at least one of these diseases. If both parents have one or more of these conditions, the chances are much greater that their child will, too. An estimated 10% of all people worldwide are affected by atopic dermatitis at some point in their life. Unlike contact dermatitis around the eyes, there are many complications that can be developed from having atopic dermatitis. You are even more susceptible to getting allergic and irritant contact dermatitis if you suffer from AD. Chronic itchy, scaly skin. A skin condition called neurodermatitis starts with a patch of itchy skin. You scratch the area, which makes it even itchier. Eventually, you may scratch simply out of habit. This condition can cause the affected skin to become discolored, thick and leathery. As you can see, atopic dermatitis can lead to several issues. There are many things you can do to prevent atopic dermatitis around your eyes. Some of these preventative measures could result in eye damage. Do not attempt to treat your dermatitis around eyes if dangerous chemicals are being used. Some of the preventative steps are below. Moisturize your skin at least twice a day. Creams, ointments and lotions seal in moisture. Choose a product or products that work well for you. Using petroleum jelly on your baby’s skin may help prevent development of atopic dermatitis. If you feel you suffer from atopic dermatitis around your eyes, consult a physician. 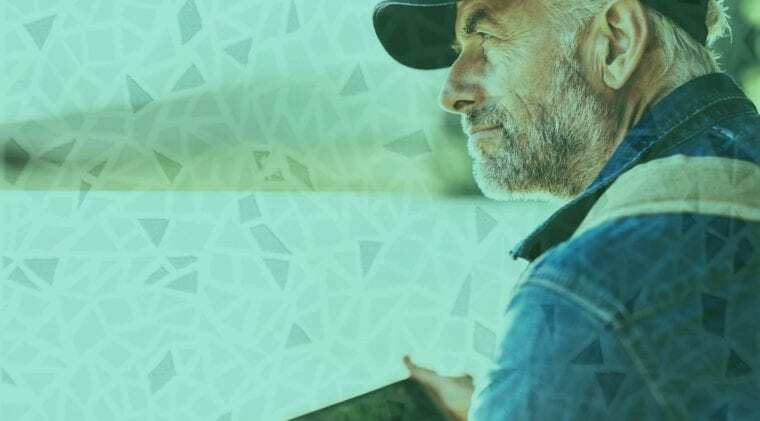 Your physician will be able to identify atopic dermatitis rapidly by sight and a medical review. Each person will have a different treatment plan. Even if you have found a good treatment plan, atopic dermatitis can return. 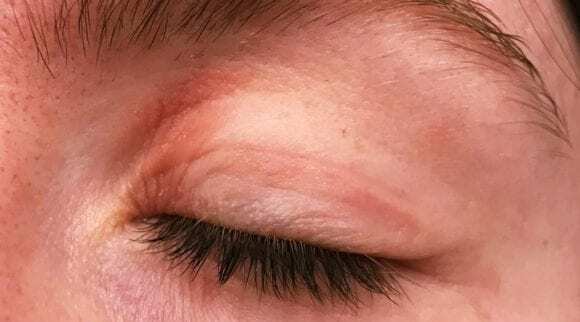 Using the products we discuss in this article will help keep atopic dermatitis around your eyes from getting out of control. The next form of dermatitis around eyes we will discuss is Seborrheic dermatitis. Seborrheic dermatitis may go away without treatment. Or you may need many repeated treatments before the symptoms go away. And they may return later. Daily cleansing with a gentle soap and shampoo can help reduce oiliness and dead skin buildup. 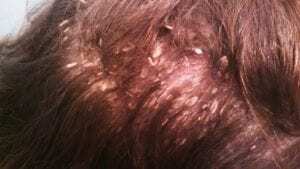 Seborrheic dermatitis is also called dandruff, seborrheic eczema and seborrheic psoriasis. There are several symptoms that you may notice when you develop seborrheic dermatitis. 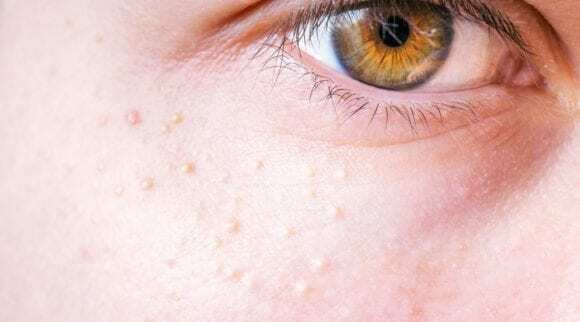 The main symptoms are patches of greasy skin covered with flaky white or yellow scales or crust on the scalp, face, sides of the nose, eyebrows, ears, eyelids, chest, armpits, groin area or under the breasts, red skin, and itching. These symptoms can worsen with stress and cold temperatures. There are no exact causes of seborrheic dermatitis. It could be related to a fungus that is in the oil that is secreted in the skin. Another cause could be an irregular response from your immune system. When you visit your physician he or she may collect skin cells for examination. Once diagnosed with seborrheic dermatitis, your physician will recommend a treatment plan. This plan could be prescription medications or ointments. There are several ways to control seborrheic dermatitis around your eyes. Apply a medicated cream. First try a mild corticosteroid cream on affected areas, keeping it away from the eyes. If that doesn’t work, try the anti-fungal cream like ketoconazole. The next section of this article will discuss the things that you can pick up after an appointment with your physician. These over-the-counter products will help alleviate the symptoms and pain of dermatitis around your eyes. The treatment we will cover first is the only spray bottle treatment on the list. Heyedrate Lid & Lash Cleanser can be purchased in 1-oz. spray bottles. Its safe formula of hypochlorous acid, electrolyzed water and sodium chloride can be sprayed directly on to areas of dermatitis around your eyes. It can also be sprayed on a cotton round and applied to the areas of dermatitis. Like many of the other products on this list, it is alcohol, fragrance, sulfate, and preservative free. It is certified as 100% organic, natural, and vegan. Heyedrate is able to keep your skin free and clear of various eye and skin conditions. The hypochlorous acid removes contaminants and neutralizes inflammation. Heyedrate is easy to apply on yourself and others. You need to clean away any make-up and debris before spraying two sprays of their solution. Once it is sprayed on the dermatitis around your eyes, you can simply let it dry or rub it in gently. It is best used twice a day in order to keep inflammation under control. Heyedrate is made in the United States and has a 2-year shelf life which means you can keep it around if you have a flare up of any type of skin condition. It is backed by a 100% satisfaction guarantee, which gives you no reason not to try it! 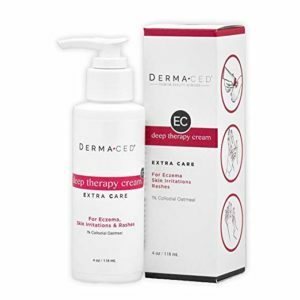 The second product on our list is Dermaced Deep Therapy Cream Extra Care. This cream was developed to care for eczema, skin irritations, and rashes. It is available in a 4-oz. bottle. The active ingredient in Dermaced is colloidal oatmeal. Having an active ingredient of oatmeal may seem strange to most people. Oats have a high concentration of beta-glucan. Beta-glucan creates a water-holding barrier to protect damaged skin, and this simultaneously reduces skin inflammation, provides a powerful anti-itch effect, moisturizes and softens the skin with antioxidants, and even triggers immune cells to start the healing process. There are several other additional oils that Dermaced contains that aid in treating dermatitis around eyes. Dermaced added jojoba seed oil, sunflower oil, and sweet almond oil. These oils are important because they include nutrients, fatty acids, and antioxidants to help the skin repair damage. Other lotions have a low oil content that can worsen dry skin because moisture easily evaporates. Dermaced formulated their cream with a high oil content to flood the skin with moisture. Other added ingredients in Dermaced are chamomile, grapefruit seed, cucumber fruit, and coneflower. These ingredients were added to help defend against bacteria and viruses. These ingredients also help reduce inflammation. Dermaced also added beeswax to their cream. Beeswax acts as a natural sealant that locks in moisture to prevent evaporation. With beeswax, your skin will not feel sticky like it does with other moisturizing products. Even as an FDA approved eczema treatment, Dermaced does not contain steroids. Steroids are generally used to treat eczema outbreaks. Dermaced has replaced steroids with licorice extract. Licorice extract acts like a steroid without the side effects. This extract mimics cortisol in reducing inflammation and itchiness. Much like Calmoseptine, Dermaced is FDA approved. 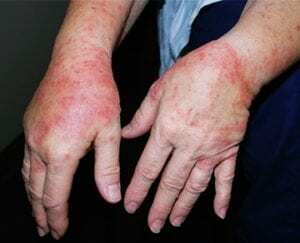 The FDA approved Dermaced as an eczema treatment. Dermaced is unscented to prevent any irritation caused by artificial fragrances. This product can be purchased as a lotion or as a cream for better versatility. Interestingly, Dermaced has a satisfaction or your money back guarantee. The next product on our list is from another company that has been around over 50 years. The third treatment for dermatitis around eyes is made by Eucerin. Eucerin has been developing and pioneering skincare innovations or over 100 years. Eucerin is one of the most recommended skin care brands on the market. Eucerin Eczema Relief Flare-Up Treatment is available in a 2-oz. squeezable tube. Like Dermaced, Eucerin’s active ingredient is colloidal oatmeal. The colloidal oatmeal acts as a skin protectant. Eurcerin also contains Ceramide-3. Ceramide helps improve the condition of your skin. The steroid free formula that Eucerin developed uses Licorice root extract to mimic the effects of actual steroids. Eucerin instantly cools any irritation on contact. It does not contain as many natural ingredients as some products on this list, but it is an effective product. 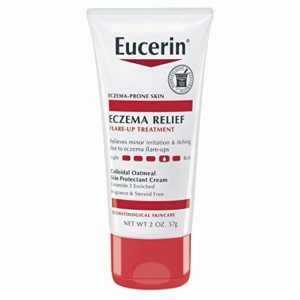 Eucerin Eczema Relief Flare-Up Treatment should not be the product you use when you are first diagnosed with eczema, but it will keep eczema under control from any subsequent outbreaks. The fourth treatment for dermatitis around eyes is BeeFriendly Face and Eye Cream. This USDA certified, organic rejuvenating and anti-aging moisturizer is great for use on your face, eyelids, and neck. It is available in 2-oz. tubs and is handmade in the United States. The list of ingredients is quite simple. 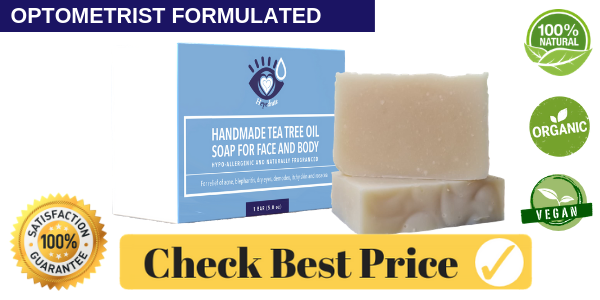 It contains: purified water, extra virgin olive oil, beeswax, raw honey, vitamin E, bergamot essential oil, and amyris sandalwood essential oil. Raw honey acts as an antibiotic and helps hydrate your skin. Beeswax helps improve the elasticity of your skin and does not clog your pores. The olive oil ingredient contains vitamin A and E, along with some fatty acids to help moisturize your skin. This cream is highly concentrated and a little bit goes a long way. It also acts as a four-in-one cream. It helps treat acne-prone skin, sensitive skin, dry skin, and dermatitis. 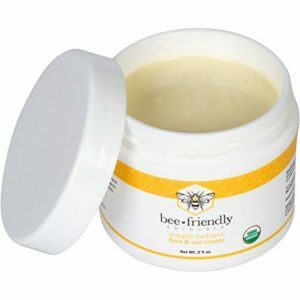 Every ingredient that BeeFriendly adds to their product has a beneficial effect on your skin. It is easy to apply and should be used daily. You need to cleanse your skin and rub in BeeFriendly Face and Eye Cream until it is fully absorbed. Most of the cream will absorb in to your skin so that you can apply it and go about your day. You will not have to worry about having any visible face cream while in public. If it does not fully absorb in to your skin, any excess cream can be used on any part of your body. BeeFriendly prides themselves on their product containing no chemicals, no fillers, no SLS, no animal testing, no fragrances, and no gluten. This product is safe to use during the day or you could apply it during the evening. This product does have a light refreshing scent that is caused by the organic ingredients, not by any extra chemicals. It is backed by a 60-day satisfaction guarantee, so if it does not help with the dermatitis around your eyes, you can return it for a refund. The next product on our list is also chemical-free and contains many plant-based ingredients. The fifth treatment for dermatitis around eyes is a plant-based cream. 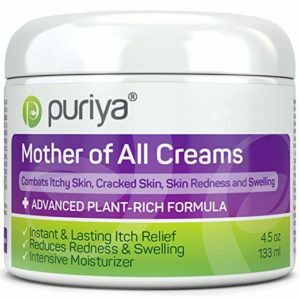 Puriya’s Mother of All Creams is a 13-in-1 plant-rich formula. It is free of chemicals and can be used on the hands, feet, face, and even your scalp. It is available in a 4.5-oz tub and is proudly made in the United States. Some of the plant-based products used in this cream are safflower oil, avocado oil, jojoba oil, honey, rosemary extract, and carrot seed oil. Puriya uses three main ingredients that supplemented by the ingredients listed above. Amaranth oil is the main ingredient of Puriya’s Mother of All Creams. Amaranth oil contains high levels of vitamin B and E. It is considered the highest plant source of Squalene. Squalnee is an anti-inflammatory, cell growth enhancer, and an anti-allergic compound. Amaranth oil is great for treating skin irritations that are caused by allergies, but it can be used to treat any skin condition. Aloe vera is the second most important ingredient in this cream. Aloe vera contains vitamin A, C, and E. It contains 22 amino acids along with zinc, selenium, calcium, and magnesium. These ingredients provide a protective moisturizing layer to your skin. The third important ingredient is shea butter. Shea butter contains vitamin A and E and helps repair damaged skin. It is useful to treat dermatitis around eyes because it reduces inflammation and itchiness. Although this cream will provide instant relief to dry and cracked skin, it is formulated to relieve pain, inflammation, and to heal damaged skin. Puriya’s Mother of All Creams has a 180-day money back guarantee. If you are not satisfied with their results, they will gladly refund your money. The next treatment for dermatitis around your eyes can be used preemptively or as a treatment as the need arises. This ointment is available in a 4-oz. tube, a 2.5-oz. tube, a 2.5-oz. jar, a 20-gram tube, or in 1/8-oz. single use packets. The main ingredients are zinc oxide and menthol. One thing that sets Calmoseptine apart from other products on this list is that Calmoseptine is FDA approved as a skin protectant. Calmoseptine was originally developed over 80 years ago for use as a diaper rash ointment for infants. Calmoseptine Moisture Barrier Ointment is a fantastic treatment for dermatitis around eyes. It is also useful for any type of itching, hives, and psoriasis. It is extremely easy to use. 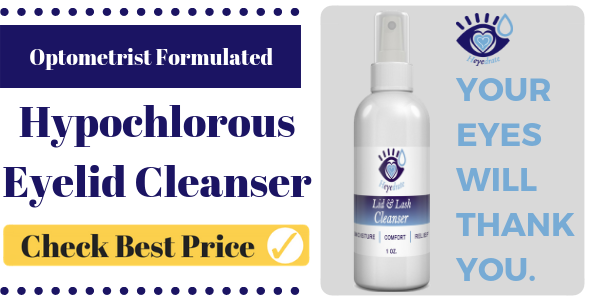 You simply cleanse your skin gently with mild skin cleanser. You should pat wet areas until they are dry or allow to air dry. Apply a thin layer of Calmoseptine Ointment to reddened or irritated skin 2-4 times daily. The ointment that comes out of the tube appears to be thick, but do not be alarmed. You can spread the ointment very thinly so that it does not stand out while you use it. This ointment is safe to use on even the most sensitive skin. It does not contain latex, nuts, nut oils, wheat gluten, fish oils, or dairy derivatives. There is a reason that Calmoseptine has been used and recommended for the last 80 years. This product is effective, FDA approved, and can be used for a multitude of ailments. Calmoseptine is the best product on our list to treat dermatitis around your eyes. The next product on the list is much like Calmoseptine. It can treat many ailments. The seventh treatment for dermatitis around the eyes is Thena Healing Cream Ultimate Skin Therapy. This cream can be purchased in a 2.25-oz., 4.5-oz., or a 9-oz. tub. Thena formulated this skin cream with a 25-in-1 plant-based blend. It is 99.6% natural, raw, and organic. This cream is gluten-free and fragrance-free. It can be used on even the most sensitive skin. Thena’s proprietary plant-based blend contains concentrated nutrients and calming oils. These oils penetrate your skin for long lasting results. Unlike steroid treatments, this cream is designed to reduce pain and inflammation without harmful side effects. Thena uses aloe vera to protect your skin. They combined olive leaf, calendula, and rosemary extract for their antimicrobial properties to ward off infection. They combined comfrey and chamomile to soothe irritated skin and promote healing. Other plant-based ingredients include: safflower oil, avocado oil, jojoba oil, amaranth oil, coconut oil and many other organic substances. This organic blend was formulated to target itchy, dry, and cracked skin. This cream is a great treatment for dermatitis around your eyes because it is so natural and fast acting. Thena’s Healing Cream is easily absorbed by your skin so the amount you purchase will last quite a while. 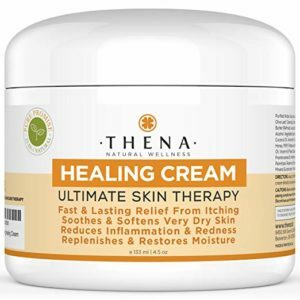 Unlike some other heavy creams and lotions, Thena’s Healing Cream will not clog your pores. Your skin should come back clearer, smoother, and healthier than before you used this Thena product. If you are not satisfied with this product, Thena backs it up with a money back guarantee. The next treatment we will discuss is a product that has been widely used throughout the United States. 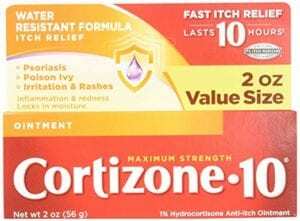 Cortizone 10 is an anti-itch cream that features a main ingredient of hydrocortisone with some aloe as well. Because of its array of uses, it is not higher on our list as one of the most effective treatments. Hydrocortizone’s main purpose is to eliminate the itch caused by dermatitis around the eyes. This product can be applied to bug bites, psoriasis, and poison ivy contact locations. There are many versions of Cortizone 10, but the maximum strength is the best of that group. It can be purchased in a 2-oz. squeezable tube. Cortizone 10 should only be applied topically. It is a thick cream so it needs to be rubbed gently into the skin. It is non-greasy and will begin working quickly once applied. Cortizone 10 has been used for decades and is a proven product. Unfortunately, it is not as organic and natural as the other creams on our list. It can be located at big box stores and your local pharmacy. The availability and quality of this product lands it on our list. Dermatitis around the eyes is an itchy, painful experience. If you find yourself with dry, cracking skin on your face, please consult a physician. A physician can rule out any other serious conditions before beginning a treatment plan for the dermatitis around your eyes. After you have a definitive diagnosis, you can begin to treat your dermatitis with these over the counter options. All of the above products have unique formulas. Finding one that alleviates your symptoms faster and longer than the others is key. Most of these products are backed by a guarantee so you can purchase them without any worries. Dermatitis can change every time you have a flare up. If that happens to you, you can pick another product on this list for treatment. 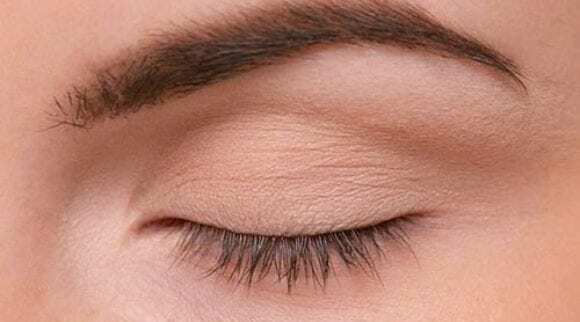 Following the guidance above, based on your type of dermatitis, and using the products listed in this article, you should have confidence in getting rid of dermatitis around your eyes. Being diagnosed with dermatitis can be scary because it often lasts a lifetime. With these products you can keep your dermatitis under control and still live your normal life.